Work up a good sweat and target your abs, obliques & lower back with this workout that uses a wide range of exercises - without a single repeat move - to target your entire core and burn off some extra calories with cardio. The only equipment you need is an optional exercise mat, otherwise you can do this workout anywhere. A lean stomach is a very common fitness goal, the unfortunate part is that many people go about trying to burn belly fat the wrong way. It is impossible to spot reduce fat anywhere on the body. The best way to lose belly fat is with total body strength training, and various intensities & training types of cardio, like you'll find in our 4 Week Core Program. Strength training builds lean muscle, boosting your metabolism around the clock, and high intensity interval training (HIIT) can also give you a temporary metabolism boost while your body recovers. We love these two training types and they're a great example of working smarter instead of harder (though I doubt anyone here is going to argue that HIIT is easy). That doesn't mean that core workouts aren't important or that they don't have a place in your routine. Core strength is a crucial component of being able to safely push yourself during tough HIIT and strength workouts, which is why it's so important to be careful which abdominal workouts you're doing; it can make you vulnerable to injury if you're only working the front of your core - what people most commonly refer to as the "abs" - but for well developed, balanced strength, you have to be careful to make sure that you're working your abs, obliques & lower back as well. We've got 4 groups of six different exercises, all from a different category. There's crunches, planks, HIIT or cardio (we show modifications for both), Pilates, back, and a burnout round. We have provided low impact and/or more beginner friendly options all throughout in hopes of making this workout more accessible for beginners - never hesitate to make modifications where you need to. We'll be doing 45 seconds on, 15 seconds rest. You won't need any equipment, outside of an optional exercise mat. There is no warm up in this particular video, so make sure to get one in before you jump into this workout video. A cool down and stretch is included. If you like the structure of this workout, be sure and check out the other videos in our "for people who get bored easily" series", below. How many of these have you tried so far? Do you have a favorite? What kinds of workouts might you like to see next? 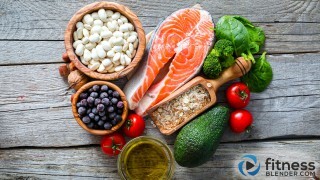 Menopause Nutrition: What foods are good for menopause?